The Sacrament of Confirmation is that sacrament by which, through the laying on of hands, the anointing with chrism, and through prayer, the baptized are strengthened by the Holy Spirit in order to profess and defend the faith and live up to it faithfully. Confirmation completes the graces of baptism, and is indeed one of the three Sacraments of Initiation along with Baptism and the Holy Eucharist. As the Catechism of the Catholic Church tells us, “Every baptized person not yet confirmed can and should receive the sacrament of Confirmation." Since Baptism, Confirmation, and Eucharist form a unity, it follows that "the faithful are obliged to receive this sacrament at the appropriate time," for without Confirmation and Eucharist, Baptism is certainly valid and efficacious, but Christian initiation remains incomplete. If you are a Catholic young adult or adult who has not yet received the Sacrament of Confirmation, please call the Parish Office at (918) 744-0023. We will be happy to prepare you in a manner appropriate to your circumstances. The best way to understand Confirmation is to see it standing between Baptism and Eucharist as part of the Rites of Christian Initiation. This is the approach taken by the Catechism of the Catholic Church, which treats Confirmation under the heading "Sacraments of Christian Initiation," and insists that the unity of Baptism, Confirmation, Eucharist "must be safeguarded." Baptism, Confirmation and Eucharist exist in relationship: In Baptism (1) we take off the old, sinful person and wash away Original Sin. In Confirmation (2) we are anointed with the oil of the Holy Spirit and filled with his sevenfold gifts. Finally, (3) we are led to the Eucharistic banquet. To understand better this relationship, it is helpful to remember that our liturgical ceremonies for initiation are influenced by Roman customs at the time our rites were being formed. In second-century Rome, after bathing, people rubbed their bodies with oil to moisturize the skin and dry off. Similarly, the bath of Baptism was followed by an anointing: Confirmation. In early Church documents we do not find much written about Confirmation because it was considered part of Baptism. In these documents, the authors, when writing about Baptism, often meant both Baptism and Confirmation, both the water bath and the anointing with oil. Likewise today, if I said, "I am going to take a bath," I would mean both the "washing" and the "drying off." To further delineate this "bath" analogy, we can say that when we take a bath, we get clean by washing off the dirt. We can speak of "getting clean" and we can speak of "washing off dirt" but, in fact, removing "dirtiness" and receiving "cleanness" go together. In the Sacraments of Initiation, we wash away Original Sin and receive the Holy Spirit. Taking away sin and being filled with the grace (presence) of the Holy Spirit, are something like the "washing off" and "getting clean." The two actions go together and are understood in relation to each other. We can call one action Baptism and the other Confirmation. We can even celebrate them at two different times in a person's faith journey, but to understand them correctly we must view them together. It is one and the same Holy Spirit celebrated at Baptism, Confirmation and Eucharist. Each sacrament is both sign and words. To understand Confirmation, the Sacrament of the Spirit, we examine the words that accompany the anointing and compare them with the prayers which speak of the Holy Spirit in Baptism and Eucharist. and unseal for her the fountain of baptism. by water and the Spirit. the spirit of  knowledge and  reverence. Fill them with the spirit of  wonder and awe in your presence. This prayer names the traditional "Seven Gifts of the Holy Spirit." The biblical origin of these seven gifts is found in Isaiah (11:1-3) where he is foretelling the qualities of the Messiah. These seven gifts are the signs that the Messiah will be guided by the Spirit. The relation of these gifts to the sacrament of Confirmation becomes clear when we remember that the word "Messiah" (Christos in Greek) means "anointed." Jesus was "anointed," filled with the Holy Spirit at His baptism. At Confirmation we are anointed with the Holy Spirit. Throughout the Gospels we see how these seven gifts form Jesus' personality. They are characteristic of His activity. Consider the wisdom expressed in His parables; His understanding of the poor and the sick; His right judgment when tested by the Pharisees; His courage to continue the journey to Jerusalem where He surmised what fate awaited him; His knowledge of God's will; His reverence for His heavenly Father; His awe before the wonders of creation—the lilies of the field, the birds of the air....The seven gifts of the Holy Spirit are the manifestation of the Divine Power active in the life of Jesus of Nazareth. In Baptism, our sins are washed away and we come up from the water bath to be clothed in a new garment. Putting on the baptismal garment is a visible symbol of the invisible reality of "putting on Christ." When we are anointed with oil in Confirmation, it is a visible symbol of the invisible reality of being anointed with the Spirit, being "Christ-ed" or "messiah-ed." We put on Christ, and the sevenfold gifts of the Spirit become our gifts. We pray that the qualities of the Messiah take root in us and become our qualities so that we may become signs of God's presence in the world. At the actual anointing during Confirmation we hear the words: "(Name), be sealed with the gift of the Holy Spirit." Here the gift referred to is the Holy Spirit himself. We are sealed with the gift of (that is, the gift which is) the Holy Spirit. The Holy Spirit is God's "first gift to those who believe" (Eucharistic Prayer IV). "The holy Eucharist completes Christian initiation" (Catechism). With our sins washed away and clothed in the Spirit, we are led to the banquet table of the Eucharist. The Eucharistic prayers given us following Vatican II express the role of the Holy Spirit even more clearly than the traditional Roman Canon (Eucharistic Prayer I). Although the words vary according to the prayer, at each Eucharist we ask God: "Let your Spirit come upon these gifts to make them holy, so that they may become for us the body and the blood of our Lord, Jesus Christ... [so that] ... all of us who share in the body and blood of Christ may be brought together in unity by the Holy Spirit" (Eucharistic Prayer II). At each Eucharist we ask the Holy Spirit to do two things: first, to change the bread and wine into the sacred Body and Blood of Christ; and, second, to change us—those who eat and drink the sacred bread and wine—into the sacred Body and Blood of Christ. The saying, "You are what you eat," certainly holds true here. As St. Augustine reminded his fourth-century audience: "If then you are the body of Christ and his members, it is your sacrament that reposes on the altar of the Lord....Be what you see and receive what you are" and "There you are on the table, and there you are in the chalice." As Catholics, we are proud of our tradition of reverence for the Body and Blood of Christ, which by faith we perceive really present in the action of the Spirit changing the bread and wine. This same Spirit challenges us to the often more difficult reverence for the Body of Christ which, by faith, we perceive really present in the action of the Spirit who changes our faith community. "Grant that we, who are nourished by his body and blood, may be filled with his Holy Spirit, and become one body, one spirit in Christ" (Eucharistic Prayer III). 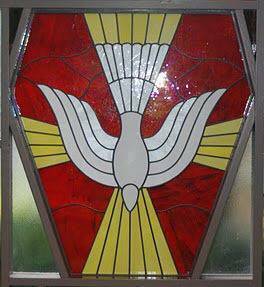 The Catechism's section on Confirmation says that Confirmation is the special outpouring of the Holy Spirit. Its effects are to: 1) root us more deeply in divine filiation (being children of God); 2) unite us more firmly to Christ; 3) increase the gifts of the Holy Spirit in us; 4) strengthens our bond with the Church; 5) associates us more closely to her mission of bearing witness to Christ; and 6) helps us and more strictly obliges us to spread and defend the faith by word and deed. The bishop was the original minister of Confirmation. Ordinarily, the bishop still administers this sacrament so that there is a clear link to the first outpouring of the Holy Spirit at Pentecost. However bishops can also permit priests to administer this sacrament, and in practice this is often done, particularly at Easter. The essential part of the Confirmation rite is when the bishop or priest places his hand upon the head of each individual. The bishop traces the sign of the cross on the person's forehead—having first dipped his thumb in the holy oil called chrism—and says, "Be sealed with the Gifts of the Holy Spirit." The newly confirmed person responds by saying, "Amen." Chrism is one of the three kinds of holy oil which a bishop blesses each year at his Mass on Holy Thursday. The other two kinds of holy oil are the oil of catechumens (used in Baptism) and the oil of the sick (used in Anointing of the Sick). The holy oils, all of them, are composed of pure olive oil. From ancient times, olive oil has been looked upon as a strengthening substance; so much so that athletes were accustomed to bathe in olive oil before taking part in athletic contests. The significance of the holy oils used in the administration of the sacraments is then very evident: the oil represents the strengthening effect of God's grace. Besides the distinct and special blessing which each holy oil receives, chrism has another difference: balm has been mixed with it. Balm is a fragrant substance procured from the balsam tree. In the holy chrism it symbolizes the "sweet odor" of virtue; it tells of the spiritual fragrance, the attractiveness that should characterize the life of Him who puts his Confirmation graces to work. The cross which is traced upon the forehead of the person being confirmed is a powerful symbol if it is really understood and acted upon. I have only to ask myself: "Do I actually live as though there were a visible cross branded on my forehead, marking me as 'Christ's man' or 'Christ's woman'?" "In my daily life, do I really bear witness to Christ?" "By my attitude towards others, by my treatment of those around me, by my actions in general, do I proclaim: 'This is what it means to be a Christian; this is what it means to live by the Gospel'?" The grace of Confirmation will come to our aid (if we will let it) and irresistibly push back the urgings of self-will, help us to preserve our sense of values, and keep us on an even keel so that faith may triumph. The peace we find then is a real peace.